Writing the lives of saints was a thriving industry all during the middle ages. The stories of saints' lives were meant as a way of commemorating their holiness and were read by churchmen, monks and literate lay people to follow the example of humans who had achieved exceptional closeness to God. Also, a place associated with a particular saint--site of birth, miracles, martyrdom, burial, church foundations or relics--would want the miracles of their saint 'broadcast' so as to draw pilgrims. A book on a saint's life was a medieval form of public relations or advertising. This manuscript of the lives of three saintly siblings of Thorney--Thancred, Torhtred and Tova--is in a book containing biblical commentaries and saints lives which is believed to have been at the Abbey of Saints Peter, Paul and Andrew, Peterborough. It was owned by the Charles Howard, the Earl of Carlisle in the 18th century. Almost nothing is known of Thancred, Torhtred and Tova, whose veneration seems to have been limited to Thorney and its dependent house, Deeping. They were anchorites (hermits living next to a church), and there is mention that one of the brothers (Thortred?) was a martyr. The sister, Tova, was honoured after her death by the construction of a pyramid-shaped shrine over her hermitage. 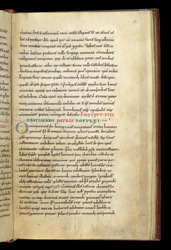 This page has the prologue written by the 11th-century abbot of Thorney, Fulcard, to his piece on them, which he presented to Bishop Walcelin of Winchester. He was almost certainly promoting them, in the face of stiff competition from Crowland's hermit, Saint Guthlac.